At Dancing for Dessert we aim to create an atmosphere of warmth, welcome and safety, where people feel comfortable, relaxed and free to express themselves. Our goal is to create a thriving community of dancers with members who are supported, inspired and elevated every time they visit our studio. We offer a full schedule of classes and private lessons for all levels of dancer in a variety of styles. 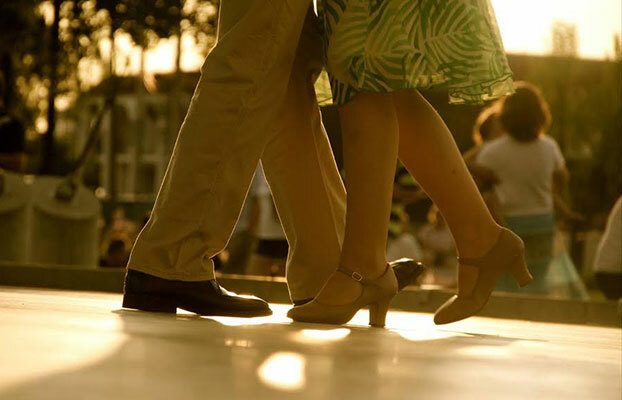 Salsa, cha cha, waltz, tango, rumba and foxtrot are just a few of the dances we teach. (Check out the full list on our dances page). Basically if it takes two it's something we do! Dancing for Dessert Studio was founded in 2005 by long-time dance team Andrew & Magda. 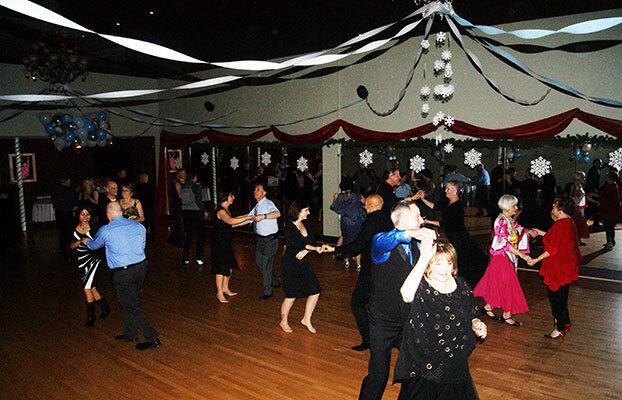 Since then it has grown to become the ballroom dancing destination for Langley and the Fraser Valley with a fantastic team of instructors and hundreds of students served. 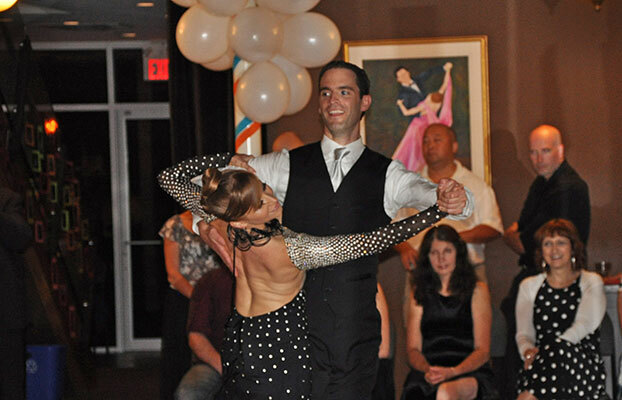 It all started in a downtown Vancouver ballroom in 1998 where Andrew & Magda first met and started dancing together. Not long after they were practicing, teaching, competing and getting engaged, all in that order. 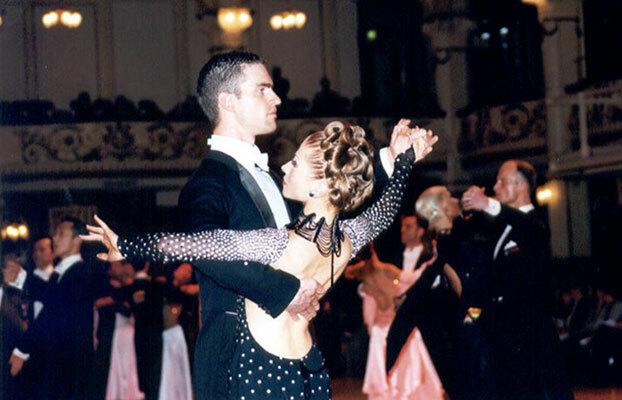 After 4 years of teaching downtown they decided to move to England to further their dancing by training and competing with the best in the world. It was a life changing experience culminating with a trip to the famous Blackpool dance festival where they competed professionally in both standard and latin. 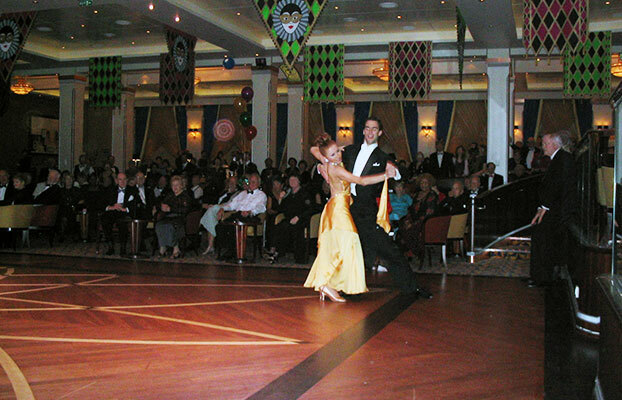 In 2004 they set sail in the cruise industry as featured dance professionals and entertainers. They sailed the Eastern States and Canada with Norwegian Cruise Lines and were the inaugural Dance Team aboard the Queen Mary II, the biggest ship in the world at the time. Back on land in 2005, Magda started a few trial classes around the Lower Mainland, eventually finding a solid foundation in North Langley. Dancing for Dessert Studio was born! For the first 5 years we taught out of Total Fitness Gym and Willoughby Hall, where we gathered students, staff and equipment. Eventually the need for a space of our own was obvious and in 2009 we moved into our current location in Walnut Grove. In September of 2015 we celebrated our 10th anniversary as a studio. Thank you so much to all of the students and staff who have made so many amazing contributions along the way. Here's to the next 10 years! 10 Year Anniversary Party Quickstep! "We have been students at Dancing for Dessert for 2 years. What a ride. It has become for us, one of the most enjoyable experiences in our lives. We were looking for a way to add an activity we could enjoy together. What we found at this studio has given us that and more. The lessons challenge both the mind and the body; it requires discipline and patience. The exercise is for the brain and muscles. There is mental, physical and social aspects all flowing in abundance from this school. The staff are so professional and committed to their fields it an inspiration being with any one of them. We could not recommend this school more highly for anyone wanting to explore the fun in this very rewarding pastime." â€œI found Dancing for Dessert near the end of 2005. I had been caring for a parent with Alzheimerâ€™s, a granddaughter had come to live with me, and I was working full time. I needed something for me. Dancing turned out to be that something. It gave me a physical, social and mental workout each evening that I attended and I soon found a special group of friends of all ages and backgrounds. Initially I only wanted to attend a social function once a week but I soon was involved in the group lessons and that evolved into a need to learn more detail so I found private lessons. Dancing has given me a physical challenge that has carried me into my 60â€™s, helped me recuperate from a bad fall and surgery 5 years ago, and brought me to a competency level that gives me a sense of accomplishment as I anticipate retirement. Other than my great grandchildren, nothing in my life compares to the fulfillment I get from my time at the dance studio. I recommend it to anyone looking to stay active, to keep their brain stimulated, and find lots of reasons to laugh every week." â€œI didnâ€™t want to go. My wife had wanted to take dance lessons so we could dance on cruises without feeling silly, but the thought of ballroom dancing just brought up memories of awkward grade 9 dances where things never ended well. However, I was shocked at how much I enjoyed the first set of lessons. The instructor was fun and encouraging, the other men in the class were just as uncomfortable and nervous, no woman turned me down when switched partners, and most importantly, after just a few lessons I noticed I could (sort of) dance! The feeling reminded me of the first time I was able to ride a bike without my dad holding on â€¦ I wasnâ€™t very good at it, but it was thrilling nonetheless. Within eight weeks we were able to go to the social dances and not look silly. Weâ€™ve now been dancing for two years, and the activity has become the highlight of our week. It's great exercise (for both mind and body), lots of fun, a great way to meet people, and the environment is very positive. Because we take regular classes, our dancing improves over time, and that creates a sense of accomplishment that is its own reward. Aside from the lessons and the weekly social dance (practice), the folks at DfD also put on special dances: Christmas, New Years, Valentines, etc. Iâ€™m happy to report that these events have cookies (and much else!)." © 2016 Dancing for Dessert Inc.